Short sleeve t-shirt in black. Crewneck collar. Tonal heart logos printed at front. Tonal stitching. Long curb chain necklace in oxidized silver. Links in graduated sized throughout. Crude, unpolished texture throughout. Gold-tone toggle closure. Approx. 21 length. Long sleeve knit cardigan in black. Polka dot pattern in white. Ribbed knit crewneck collar, cuffs, and hem. Button closure at front. Logo appliqué in black at breast. Tonal stitching. Short sleeve cotton piqué polo in black. Ribbed spread collar and sleeve cuffs. Two-button placket at collar. Embroidered logo patch at breast in red, black, and white. Tennis tail hem. Tonal stitching. Long sleeve knit cardigan in navy. Polka dot pattern in white. Ribbed knit v-neck collar, cuffs, and hem. Logo appliqué in black at breast. Tonal stitching. 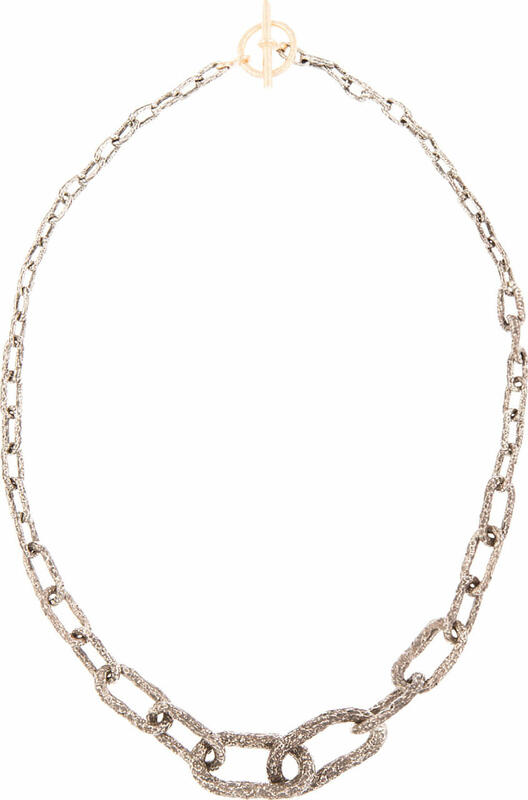 Bisected fine chain necklace in white gold. Two half-moon 0.15 carat diamonds, guaranteed GVS quality, set in three-pronged white gold. Lobster clasp closure. Approx. 10 drop chain. 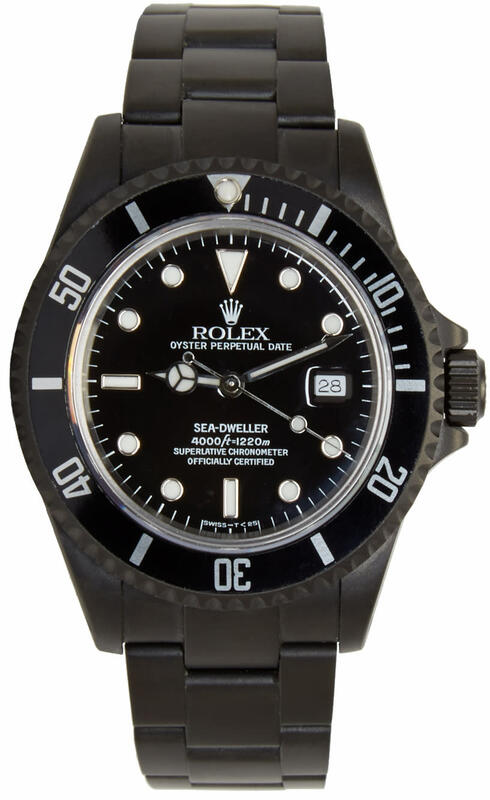 Refurbished vintage Rolex divers watch in matte black. Water resistant to depths of 1220m. 904L stainless steel base with Physical Vapor Deposition PVD matte black carbon coating. Diamond-Like Coating DLC also applied to increase strength. Swiss Official Chronometer Testing Institute COSC-certified chronometer. High-contrast Chromalight display with glow lasting up to 8 hours. Uni-directional rotating bezel with 60-minute graduations to allow for accurate and safe monitoring of diving time and decompression stops. Oyster-style bracelet with flat three-piece links can fit a maximum approximate wrist circumference of 8. Integrated patented Easylink divers extension at clasp. Swiss automatic self-winding movement. Screw-down crown and helium valve. Sapphire crystal. Full 2-year warranty. Limited edition: 26-50. Approx. 40mm dial width, 50mm lug to lug. Hoop earrings in 18k yellow gold. White freshwater pearls inset at hoop. Post-stud closure. Approx. 0.75 hoop diameter.